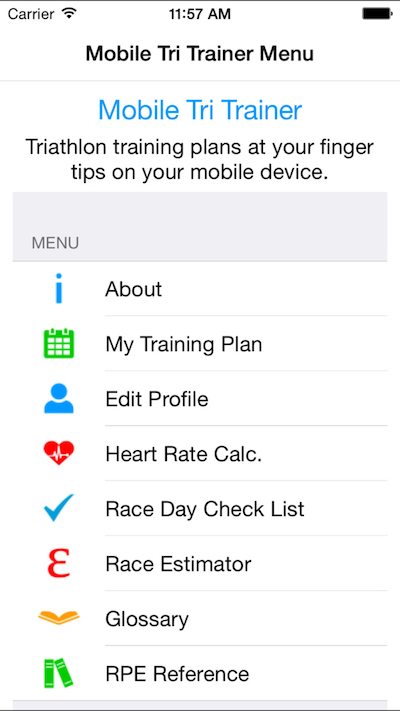 Mobile Tri Trainer puts your triathlon training program at your finger tips. Whether you are training for a sprint, olympic, half ironman or full ironman we have a plan for you. Available for download in the Apple app store for iOS users. Available in the Google Play store for Android users. Select your race distance and race date and the day of the week you want to rest, and the app will create your plan for you, mapping it out based on your race date. Then view your workouts by day or week. Log them as your complete them and track your progress. Use other tools to train smarter and get faster.